My favorite season is fall, especially when the maples turn that vibrant scarlet. I tried to do a nail gradient to reflect that stunning color change, only sparkly (of course). I did these nails while in the dark, trying to watch old episodes of Eureka, and I definitely learned my mistake. 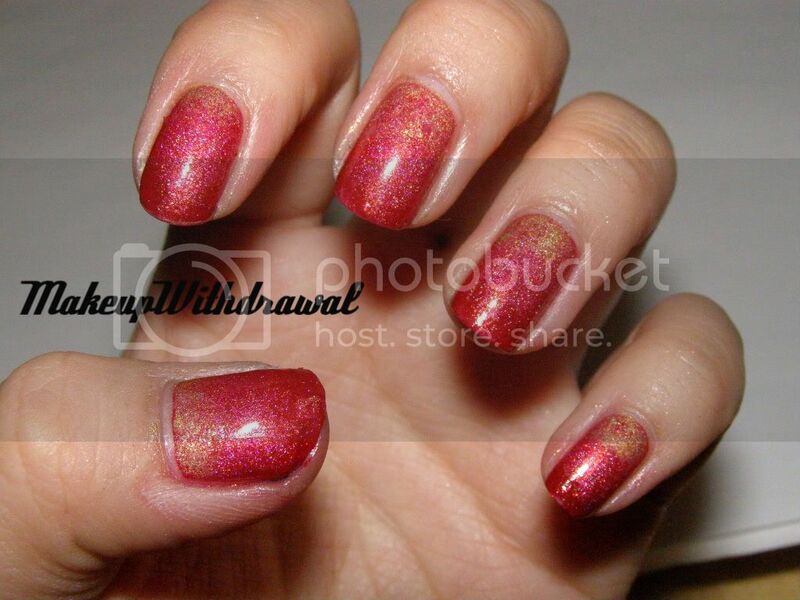 When I turned on the lights, I noticed that the gold around my cuticle wasn't sponged on very evenly! Whoops. I used Orly Top 2 Bottom as the base coat, Ulta Deck the Halls as the base color and sponged Hard Candy Lava onto the tips as well as China Glaze GR8 on the other side. Used a bit of Sally Hansen Prisms Golden Tourmaline stamped between the two to blend it out. What's your favorite thing about fall? My other fall favorites include apple cider, apple cider donuts, Turkey Gobblers from Wawa, cranberry sauce, going hiking in the crisp air and pumpkin pie. As you can see, most of my favorites have to do with food and only one has to do with exercise. No wonder I gain weight every year at this season!